Yesterday for lunch I needed to eat something quick before taking the dogs to meet our friend at the beach... 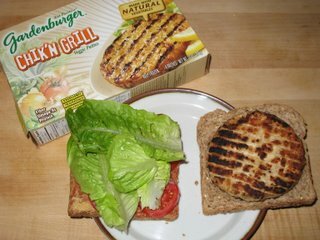 So we had these "chicken" veggie burgers from Gardenburger. They were really good! They cooked up quickly, and apparently (according to Musty), they taste like chicken. I've been veg for so long, I really have no idea if that's true, but they were yummy. 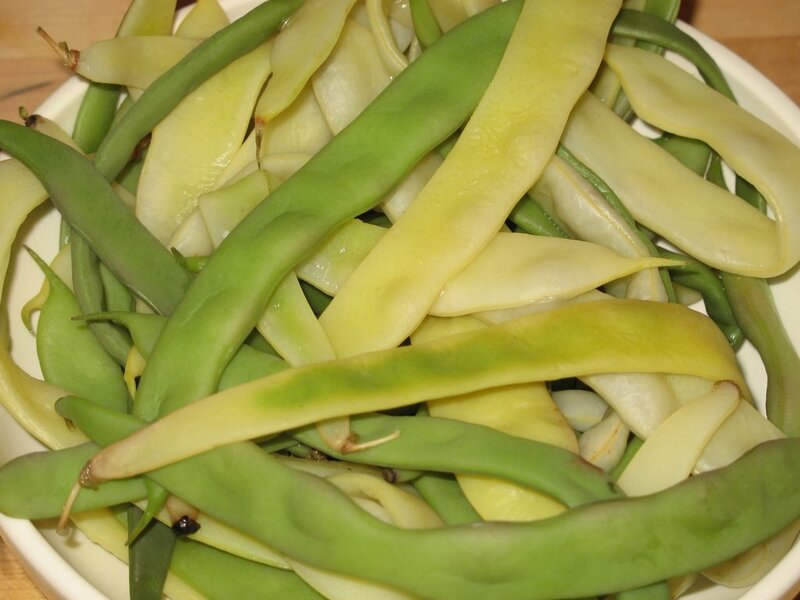 Last night's dinner was simple spaghetti, but I did make these delicious beans from the farmer's market. The green ones were dark purple before I steamed them... but the white ones really stole the show - they were so delicious! Our cat Yummers was going nuts for them, practically attacking us with snuggles until we would give him another bean. He loves his veggies. For some reason, I hadn't even really been acknowledging the beans at the market lately, but my friend JJTWH told me about some great beans she'd gotten, and sparked my curiousity. Thanks! Tonight's dinner was "Moroccan Pumpkin with Lentils" from the recent issue of "Vegetarian Times". 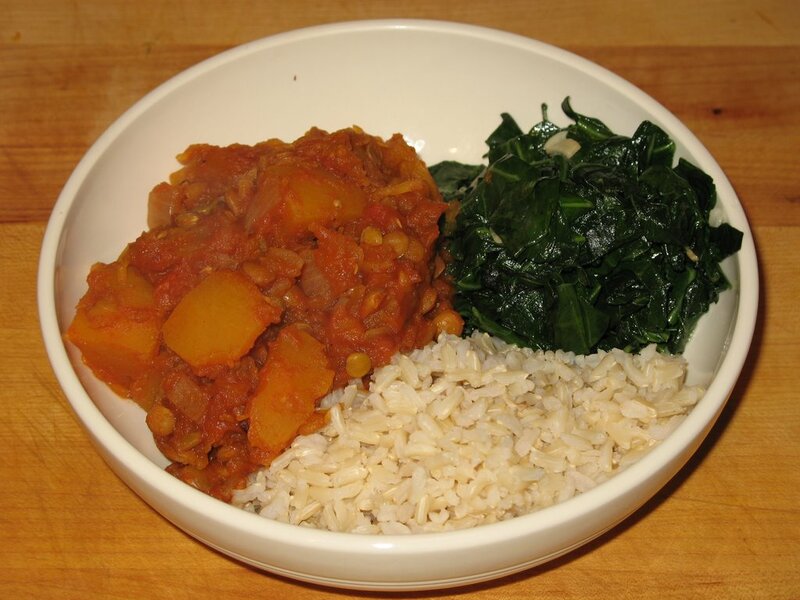 It's a very tasty stew with pumpkin, lentils, tomatoes, tomato paste, onion, paprika, cayenne, cumin... I made it with some brown basmati rice and some garlicky collards. A very nice meal. Wow, another great haul. Isn't local produce the best? Yesterday, Daiku and I drove to a farm that grows organic heirloom apples and potatoes. Some were types I'd never seen before. I felt giddy! And thanks for the tip about the chicken patties- I'd never tried them before, it's good to know they're good. that pile 'o produce looks great! Sadly our market is over for the year. Yeah, I love local produce! There is something so sweet and human about buying local food. ahhh. I love all the varieties too, it does make one giddy!! Sorry to hear that your market is closed for the year. We have three year-round markets here... but I don't know what to expect in the dead of winter. 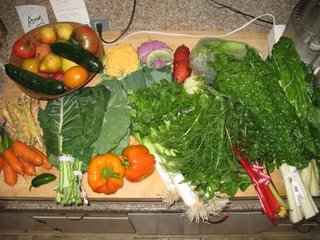 For the last 3 years I was a member of a CSA, so I wasn't going to the farmer's market because I was always completely saturated with produce. In fact, that's one of the reasons I left the CSA... was so that I could go to the farmer's market instead. So, we'll see what I"m buying by the middle of January!